You are looking at a 9 foot EarthStraw hand well pump kit. The pump system is complete including a 2 foot filler hose, however you will need to choose the mounting options for your well. For temporary rapid-deployment installations in any "open-well" choose the EarthStraw Casing Clamp (SKU: ESCC-001). For permanent installations there are many simple mounting options in the EarthStraw Accessories Section. These are also reviewed in the EarthStraw Instructional Video below. EarthStraw is easily the world’s simplest and most versatile hand well pump system. It was invented, engineered and is manufactured in the USA and is designed for rapid deployment. It may be installed temporarily or permanently…may be stored indefinitely…fits into almost any well without affecting the existing electrical equipment…and the list goes on! EarthStraw is extremely durable, lightweight and portable. As a point of reference, the 150 foot system weighs about 25 lbs. (dry) so that it may easily be carried to the well and installed in minutes…all by one person. If you need to relocate, only a few minutes are needed to uninstall, drain and re-coil it for storage or transport. The shipping and storage carton measures 36” x 36” and will fit into even the most compact car. The EarthStraw "Code Red" is only 7/8" in diameter, and is flexible, allowing it to snake through small access points, and around obstacles in the well. It will lift water up to 150 feet vertically, so as long as the foot-valve can reach the static water level in any well, EarthStraw can provide for your water needs. The ideal system length is "actual well depth minus 10 feet". This locates the foot-valve 10 feet above the bottom of the well to keep the system from pumping bottom-silt. The further your foot-valve is submerged below the water line, the more available water "reservoir" you will have. Also, deeper water is typically more filtered and will likely be cleaner and less susceptible to surface contaminants. If you are preparing for emergencies and are unsure of your well depth, or which well you will be pumping from, it is best to order a longer system and the EarthStraw Length Adjustment Kit (SKU: ESLA-001). This will allow you to quickly shorten the system if necessary to accommodate a shallower well. The system is not designed to be lengthened. If you choose to leave it in your well, the pump handle is removable to discourage tampering. We also have black or camouflaged cover bonnets available to make your system discreet. EarthStraw is affordable and will work in almost any well anywhere (and there are 15 million residential wells out there! ), even in colder climates. It has a built in weep so that the water can drop below the frost line after pumping. Every home would be safer with an EarthStraw. It can produce as much water per minute as the average household faucet, and can be easily pumped by a child. One system can supply the water needs for several families. Lead-times are longer on this series. So please order soon. You will be glad you did. There isn’t a better or lower cost way to ensure that you and your family have precious water when you need it! Note-Order activity is brisk. Lead-times are longer on this series. Click here to download and print installation and length adjustment pdf instructions. 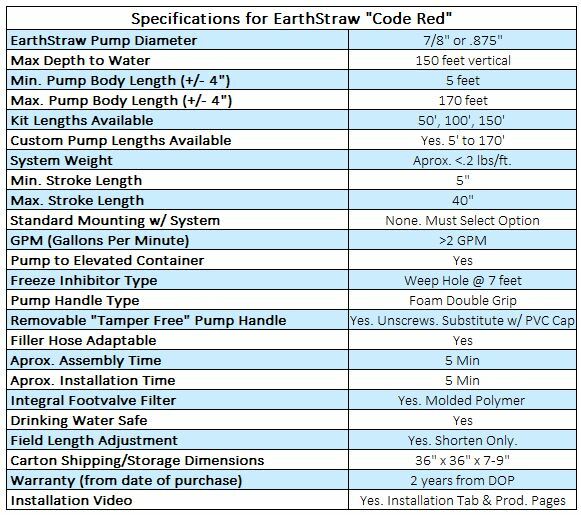 Click the button below to add the EarthStraw "Code Red" 9 Foot Pump System to your wish list.